Cleaning your air conditioner can improve its efficiency and save you money on your electricity bill. Air conditioners cool a room by sucking in the indoor air and sending it through cooling coils. Heat escapes through the exterior air conditioning grill and the air conditioning blows the cooled air back indoors. After significant use, air conditioners can collect dirt and dust on the interior grill and filter where air is sucked in. General Electric (GE) recommends cleaning their air conditioners once every 30 days. 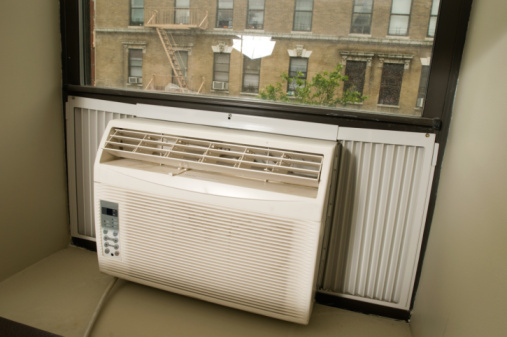 Air conditioners require regular cleaning to operate at maximum efficiency. Pull off the front air intake grill accessible from the inside of the house using the tabs that protrude from the grill. Grasp and pull out the flat, rectangular air filter from the unit. Vacuum the filter with a vacuum brush attachment. Alternatively, soak the filter for 10 minutes in a large washbasin filled with a mild soap solution and rinse with running water. Make the soap solution by adding 1 gallon of water to 1 tsp. of mild detergent. Agitate the washbasin until the soap fully incorporates into the water and add the air filter. Soak the filter for 10 minutes in a solution of water and 1/2 cup baking soda to eliminate filter odors and rinse with running water. Lean the filter on its side and allow to air dry. Vacuum the front and back of the interior grill with a brush attachment. Mix a mild soap solution in the washbasin by adding 1 gallon of water to 1 tsp. of detergent and dip a clean cloth in the solution. Wring the cloth out and wipe the front and back of the grill and the plastic air conditioner encasement cabinet. Wipe the inside bottom surface of the air conditioner, but do not disturb any of the internal parts. Replace the filter and front grill prior to continue air conditioner operation.